After I laid everything out on common brown table paper (with a hand drawn grid), it suddenly dawned on me the direction this level would take, and more importantly what role it would play in my growing campaign. Like my original Isolde-Delta map, this level went through so many changes I had to continually redraw on new paper. Thus, Level 10 was the first level I originally laid out, but didn't really have a fully fleshed out idea of what, or rather who would live there till about six months later. I envisioned a burrow of sorts with beetles, lots of beetles and two rather large set pieces around a central theme. 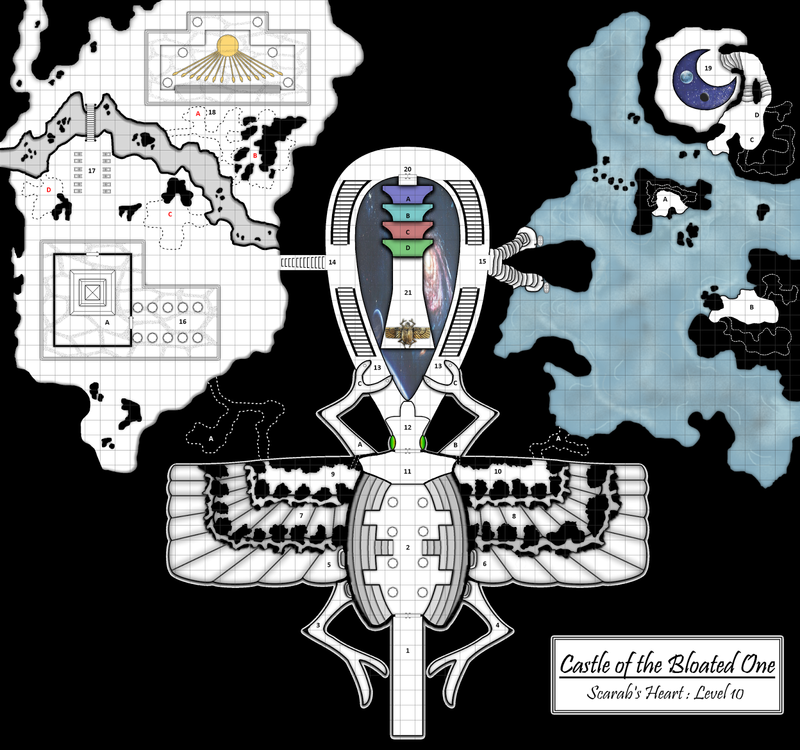 Scarab's Heart finishes off The Castle of the Bloated One's Main dungeon complex. Edit: The original I uploaded had a hidden burrows and shadow layer on the Sun Temple. Hi! This and your other maps on this page are incredible looking! I recently read your Dungeonographer review . . . did you use that tool or a different one? Thanks! I used Dungeonographer to lay out the shapes due to how quick it is to do so in DO. Then when it came to adding shading and depth effects, I exported the image as a .png into Paint Shop Pro 9 and finished adding text and other images.